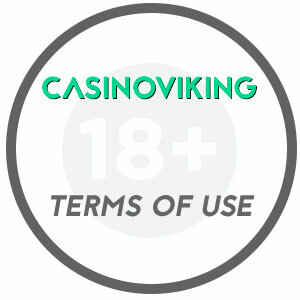 CasinoViking.com is strictly aimed towards visitors that are 18+ years old. CasinoViking.com with all its content is written for entertainment purpose. Never use the content as any type of legal advice. Always validate any information before acting upon it. CasinoViking.com is a comparison website for online casinos. We independently rank and list casinos based on our own thoughts and what we like. We are not a casino, only an independent comparison website. Therefore, we can not be held responsible for any conflicts or similar, between the casino operators and their players. We encourage anyone to read all terms and conditions for each casino as well as their bonus offers before taking any part of the casino such as registering and starting to play. These are always found at the specific casinos’ webpage. You as a visitor of this website is yourself responsible for any action taken upon the information found on CasinoViking.com. Always control and validate any information yourself since it is hard to be up to date with everything all the time. Casinos, games and such are in constant change. We reserve ourself for any typographical errors in text or images that might occur. Please contact us at casinovikings@gmail.com if you find anything misleading or wrong information. Always follow local rules, laws and requirements in regards to online gambling. These regulations vary between location and countries, why it is you that need to know what applies to you. Always make sure that you are allowed to register and play on a certain casino. Check licenses of the casino and similar agreements based on your location.